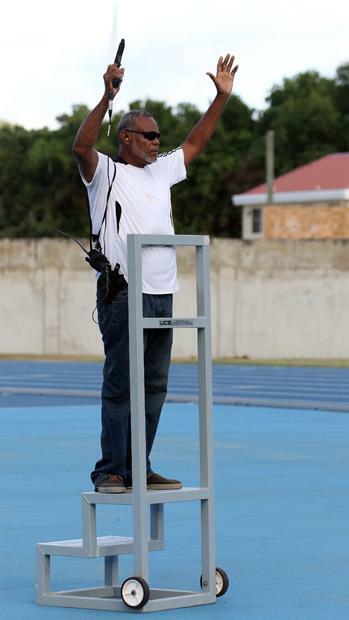 When U.S. and British Virgin Islands athletes begin lining up behind their blocks in the 45th Carifta Games in St. Georges, Grenada on Saturday morning, many will hear a familiar voice saying; "on your marks." The BVI's Patrick Harrigan is the official starter for this year's edition of the games in which the territory began participating exactly 40 years ago. "Much surprised," Harrigan said. "I said 'well look what it took for me to get to the Carifta Games after all these years.' So I'm very much surprised." Harrigan said since the passing of the IAAF Regional Development Center Director in Puerto Rico, Lenford Levy, he hadn't heard anything following a series of starting seminars he attended there and in Jamaica. He said he knew they were being prepared to start at Carifta and other competitions. "But, there was nothing else," he said. "I'm still wondering who made the nominations up to now. I was hoping that I would go to Jamaica for the Boyd and Girls Championships since we worked there and Teddy McCook was telling me he wanted to get me down there to start, so I wasn't expecting it to be this quick and I wasn't expecting it to be at Carifta." He said he must thank whoever made the nomination and felt it was worthwhile to have him going to Grenada to start. "I started in Grenada some years back just before the Hurricane came in and destroyed the stadium," he explained. "I have a little knack of what Grenada is like, but it's about trying to do a good job." Harrigan said he has been starting since he began teaching in the mid 1970s and had been at it for 38 years. Before becoming a starter, he was a member of the BVI Athletics Association and was into athletics on a whole. "I didn't compete much because I had a crazy injury trying to run the 100m so from then, the only thing I ever did was Shot Put and Discus Throw," he pointed out. "But, I was always around athletics. It was as if there was a team working as officials, so after I started teaching I would start for the Primary School events so it just carried on from there starting every meet we had." What is he looking forward to in the starting role at the Carifta Games? "Doing a good job," he said heartedly. "Making sure that everyone that I start gets a fair start. During one of the workshops I attended, I told them that the meet isn't about the officials and the guy running the workshop agreed. At the end of the meet, everyone leaves and don't remember who the starter was, so it means that things were good. I'm looking forward to having a good time, everyone gets a far chance and hopefully, be able to start at Carifta wherever it is again."